Windows 8 eliminated the Start Menu that users over the last decade have come to depend on. However, the Win + X menu – which most Windows 8 users have no clue exists – can add much-needed functionality back into the OS. 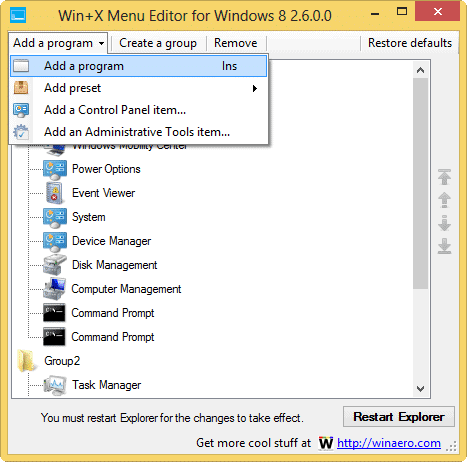 In fact, you can use the Win + X menu as is or edit it to include your most frequently used programs and more. 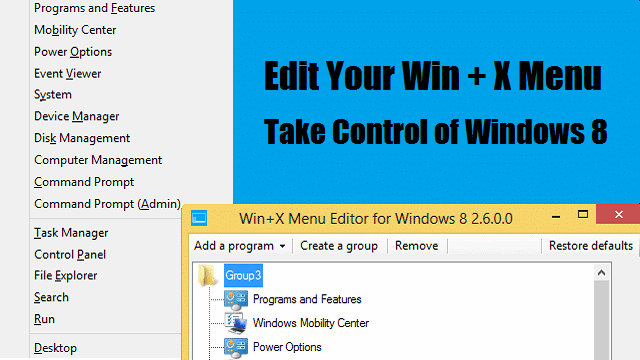 Our guide will show you how to use the default Win + X menu and how to edit it with the help of WinAero’s Win X Menu Editor freeware title. When you open the Win + X menu, it will stay on top of every other window open until you close it or choose an option. You can interact with any of the options it presents by clicking on them. 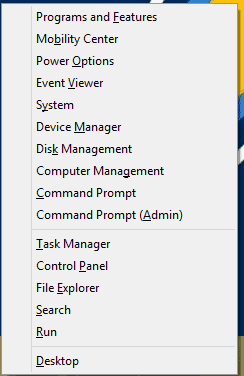 As you can see, you have a variety of commands to work within Windows 8 from here. This isn’t an “advertised feature” in Windows 8. Most users found it by accident or by scrolling through Microsoft’s long list of keyboard shortcuts. Why Microsoft would want to hide this feature from users is beyond me, it’s amazingly simple, gives you access to lost Start Menu items and can be customized. There are several different ways to edit the Win + X Menu but WinAero has designed an easy editor that lets you customize the menu. This is by far the most efficient way to get the Win + X menu the way you want it. Head to WinAero’s website and download Win+X Menu Editor. Unzip the archive, then choose the right edition for your Windows 8 PC. 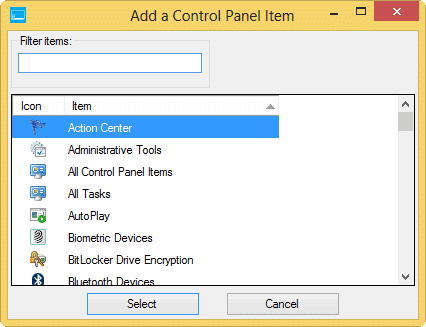 Extract the contents to an easy to access place on your PC – For ex. the Desktop or My Documents folder. 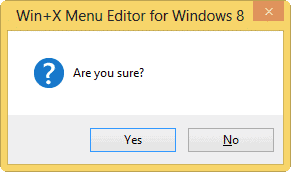 Then, run the Win+X Menu Editor. The Win X Menu Editor can create new groups, add programs and items, remove groups and let you rename items as you see fit. Click on any Group, then right-click it. 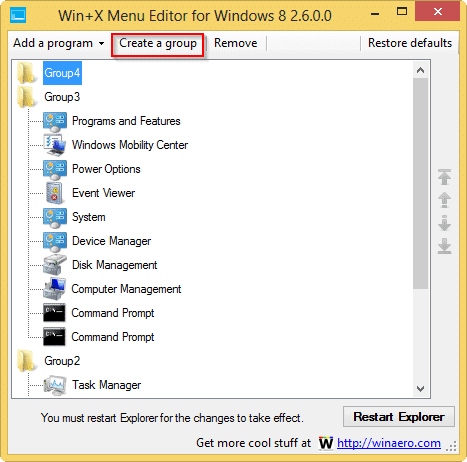 This menu will let you rename the group to something more exciting and give you an option to add a program or item to it or even remove the group entirely. Now, click on any program or item and right-click on that. 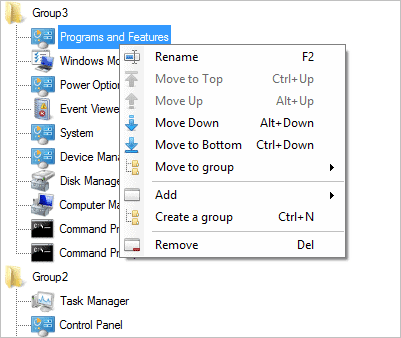 You have the same options above with a program or item you right-click on it, but you can also move the items up and down to organize them more efficiently within their groups. 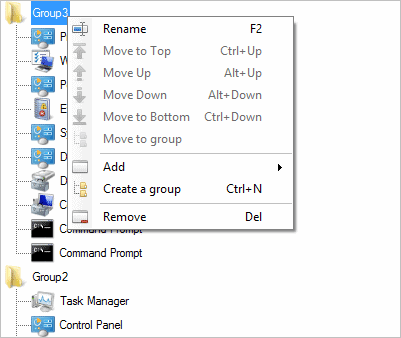 Click “Create a group” in the top toolbar to create a new group. A new group will be created, and you can rename it by right-clicking shown in the above steps. This is where the real magic of the Win X Menu Editor works. You can add a program, add presets, add a Control Panel item or add an Administrative Tool. Click on “Add a program” to get started. You’ll be asked to rename the item if you choose, click “OK” to save the addition. You’ll be able to select from several options, such as shutdown items, services and basic programs like Paint or Calculator. Click on the item you want to add. A new group will be formed and populated with the presets. In this example, we added the shutdown presets to our Win + X menu. Now, you can add a variety of Control Panel options. You can even filter to find the one you want quicker. Click “Select” once you have chosen what you want to add. Just like choosing the Control Panel options, you follow the same steps to add Administrative Tools to your Win + X menu. Your screen will flash, Windows Explorer will reset, and when you click the “Windows Key + X” again, you’ll see all your items added the way you wanted. Click “Restart Explorer” once more. Your Win + X menu will be back to its default state. 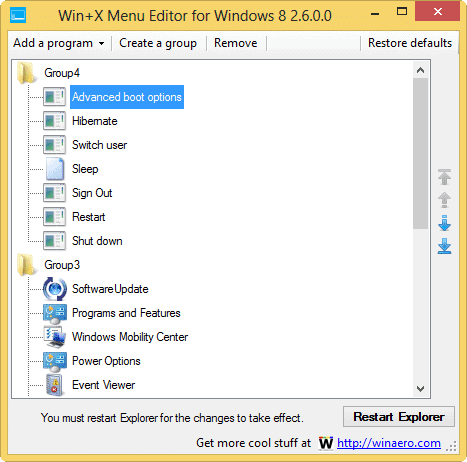 While the Win + X menu is not a replacement for the Start Menu, sometimes using simple options rather than something like Start8 or Start Menu Reviver can be the right way to work with Windows. 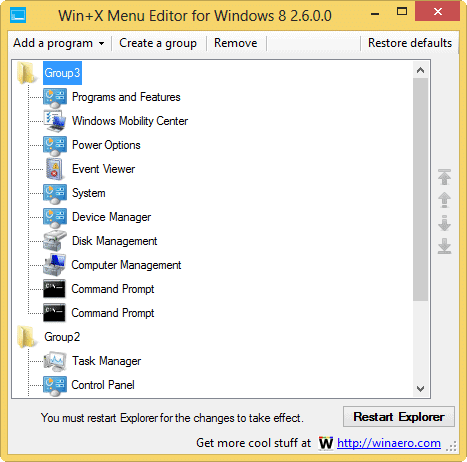 How effective is the Win + X menu in Windows 8? While the Win + X menu is not a full-on replacement for the Start Menu we’ve come to know and love, it can be a powerful tool to add functionality back to Windows 8. By customizing the Win + X menu, you can add options missing from the Start screen. 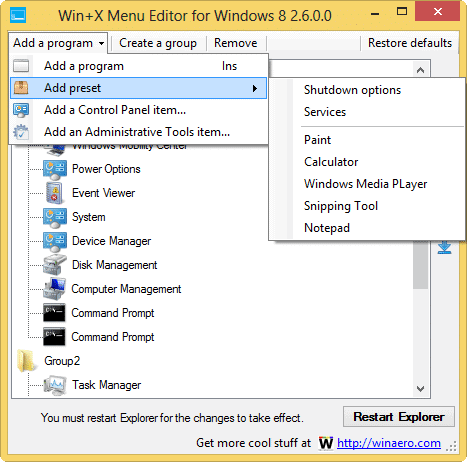 Luckily, WinAero has created a simplistic, powerful tool that lets you edit the Win + X menu the way you want, add options missing from the Start screen and take control of your Windows 8 environment. If you haven’t used the Win + X menu or didn’t know it of its existence, what are you waiting for?